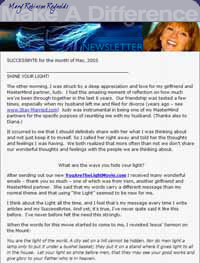 Join Mary's Inspirational newsletter for free. Thank you for the opportunity to share my movies, stories and 'new ways to think about things' ...with you. Feel free to forward movies & weekly newsletter on to your family, friends and colleagues inviting them to subscribe too!